At Ears4U, we see every day that the music industry is a high risk and unregulated population. Through creating awareness of the issues surrounding hearing wellness and offering products and service solutions to remedy them, Ears4U is on a mission to protect your hearing and keep you rocking out for years to come! Custom In-ear Monitors/IEM's, Earplugs, and Hearing Protection for Musicians, Audiologists, Engineers - both Professional & Amateur - and the hearing. The original custom personal monitors offering an unrivaled signature sound for live, studio, worship & broadcast. Since 1959, Westone has specialized in custom earplugs and earpieces as well as other products to protect and enhance hearing, facilitate communication, and support hearing care professionals. Whether you are a creator, a performer, or a music lover, Ultimate Ears have the right products for you. 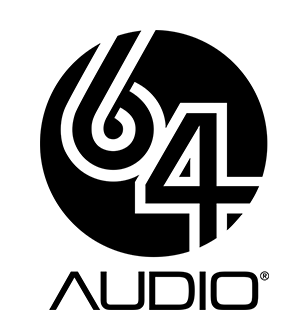 64 Audio manufactures the finest custom in-ear monitors (IEMs) & universal fit earphones. Enjoy high quality products that are handcrafted for music professionals & audiophiles.